Visit the most important parts of Madrid with this complete two-day city tour. Not only will you see the most important points of the city but when the sun goes down and get another perspective on the Madrilenian lifestyle at night. Each day these tours will last about 4 hours. First day you will do the Madrid at night starting at 19:00; the second day you will see Madrid in our morning walking tour at 08:45. See the contrast between morning and night. Your tour will start at 8:45am when you meet your guide from your departure point at Plaza Mayor. This tour you will start at one of the oldest squares of the city, Plaza Mayor, located in the center of Madrid a few meters from the square of Puerta del Sol. 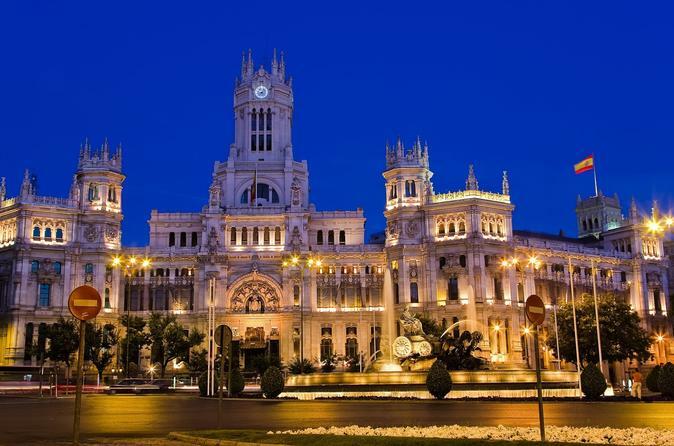 Another interesting point on this tours is Puerta del Sol, amaze yourself with the colorful and spectacular source of trade, the Metrópolis building, the Cibeles, the City Townhall or the Puerta de Alcalá. You will finish the tour at Retiro Park. The next day, meet your guide at Opera station and get to know the Madrilenian lifestyle at night and appreciate the city in a different way. Get a panoramic view of Palacio Real and Gran Via, the most famous street in the city of Madrid. The ending point is one of the oldest squares of the city, Plaza Mayor. You will get to know the main restaurants and bars so you can know how nightlife is in Madrid. If you wish, you can stay there to have dinner or get some drinks (at your expense) and continue enjoying the night at Madrid.